You sure do work fast!! Haha 🙂 Just wondering, I’ve never really noticed any shadows behind the dialogs in Piggydb. Is this a choice you made so that it would be faster? Or are shadows just more complicated in java and other Web type languages? Thanks. I wish it had more beautiful UI. But I think it would be better to allow users to customize the look and feel. I will work on that aspect after finishing the core features. It’s difficult to say. Although it has not been reported any security problems so far, Piggydb does not have a large user base. So if you have concerns, you should use it as standalone on your computer. >I know that you can manually access files, but what about text? 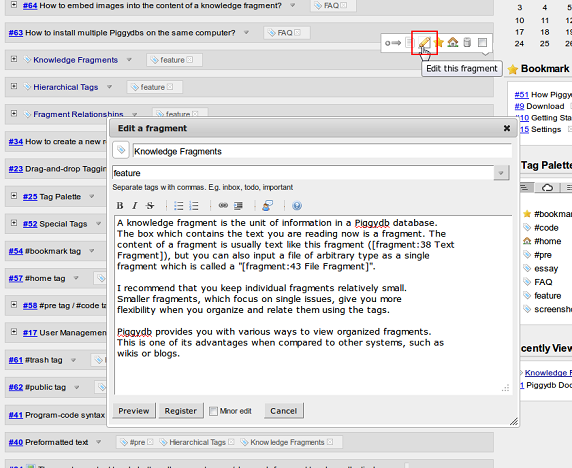 You cannot view text fragments manually as they are stored in database files. 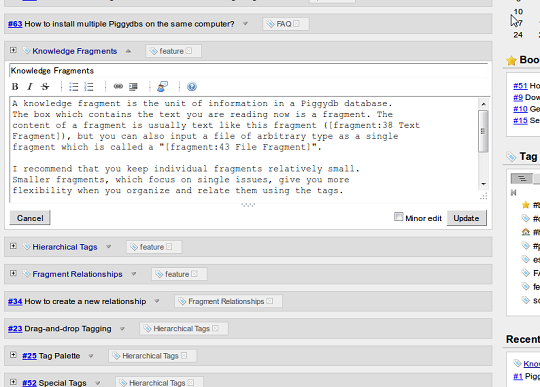 But there is an export feature (System/Export) that exports text fragments as a text file (xml file).